Avengers: Endgame officially releases on April 26th, and this 22nd movie in the Marvel Cinematic Universe will mark the end of an era, now known as the Infinity Saga. To celebrate, we want to create a podcast that listeners can tune in to remind themselves of all the amazing things that have happened in the MCU before. This isn’t quite a review podcast since our target audience is people who have already seen these films, and because we aim to involve many, many voices, it can’t quite be a discussion podcast. Instead, this is a hype podcast. This is a podcast about excitement and enthusiasm, where each contributor will record themselves answering a few questions, and then those answers will all be combined together to create episodes that reminds listeners of the best part of the films. Importantly, this is a podcast based on your memories of the films, so you can help out even if you haven’t seen them in ages. The goal is to release an episode covering Iron Man on April 5th, 2019, and then to continue to release episodes daily so that the final episode, covering Captain Marvel, will release the day before Avengers: Endgame premieres in theaters. The full release schedule can be found here. 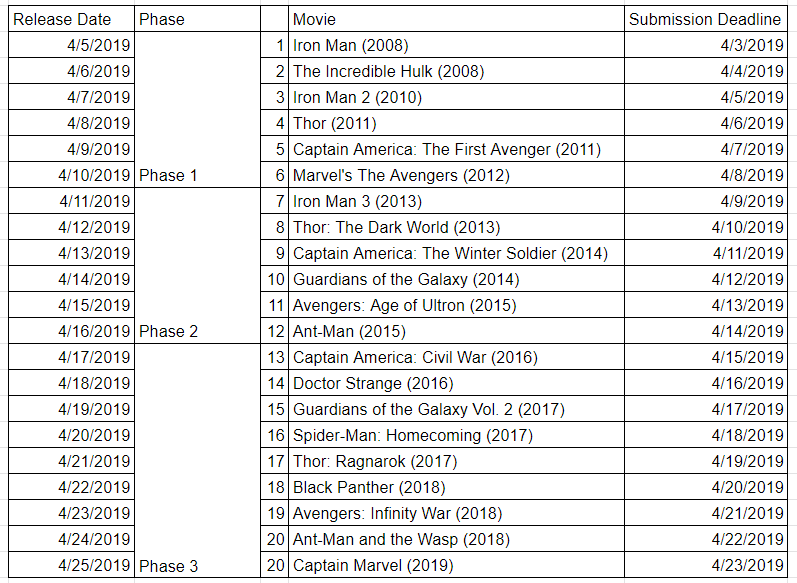 Basically, all you need to do is record your answers to questions below about any and all of the Marvel movies that you would like. Anything helps on a project like this, so whether you just want to talk about your favorite movie, or you want to record your thoughts on every single one of them, we appreciate it. Once you have recorded your answers, you’ll need to upload them using this Google Form, with answers for one movie per form submission (please name the file yourname_moviename to make sorting them easier). While we plan to use all the audio submitted, depending on the response we might not be able to include everything submitted. Be sure to fill out the question about a link to your show in the Google Form. Everyone who contributes will get one link in the show notes. Be sure that you answer the question in a complete sentence in order to make editing less of a nightmare for Troy, and expand on your answers as much as you can (i.e., if the question asks who your favorite superhero is, “Batman” is way harder to work with than “Batman is my favorite superhero because _” or “My favorite superhero is Batman because _” or even “I really love Batman beause_”). Note: Rewatching the movie you are talking about is not at all a requirement for this! Since this is an enthusiasm podcast, working from your memories of the films and speaking candidly about them is totally encouraged. If you do need a refresher on anything, though, the “quotes” page on IMDB is a great resource! What was your favorite hero moment? What was your favorite villain moment? What was your favorite action scene? What was your favorite line of dialog? What was your favorite dangling thread in this movie (this could be something that another movie already has expanded on, or something that you wish another movie would)? If you’ve got anything else you loved about this movie, feel free to keep talking! Troy Dunham is a podcaster, streamer, illustrator, graphic designer, and photographer. You can also reach us on the socials below.